Flat head syndrome is the umbrella term used to describe a number of specific flat head conditions which can appear in infants and babies, commonly caused by sustained pressure on a particular spot on a baby’s head. There are many contributing factors which can cause flat head syndrome and the condition usually becomes apparent in the first few months of a baby’s life. Spending a long time with pressure on one part of the head: Infants who sleep on their backs or in car seats without alternating their head position are at increased risk of developing flat head syndrome. However, since the incredibly successful back to sleep campaign was launched to lessen the risk of Sudden Infant Death Syndrome (SIDS), the number of babies who have died suddenly in their sleep has dramatically reduced and we fully recommend that parents follow the campaign advice and always place babies on their back to sleep. There are a number of repositioning techniques that can be used to protect against flat head syndrome in the earliest stages of their life. These repositioning techniques also develop fundamental motor skills and improve a baby’s spine and neck control whilst also reducing the tendency for a flattening to develop. We have put together some tried and tested methods to make repositioning easier and encourage babies to use and strengthen their muscles, promoting a healthy development. Muscular torticollis: Torticollis can sometimes be referred to as ‘wry-neck’ and is a condition characterised by the shortening or tightening of muscles in the neck. The condition causes the baby’s head to tilt and/or turn to favour one particular direction and causes the baby to have a limited range of motion in the neck. A baby with torticollis will appear to tilt their head to one side whilst rotating the chin in the opposite direction. If a baby is diagnosed with torticollis, they may be referred to a physiotherapist who will work through a series of exercises to gently stretch the sternocleidomastoid muscle and improve the baby’s range of motion. Parents are then given a program of exercises to continue at home. Many babies who suffer with torticollis do go on to develop a form of flat head syndrome as their inability to move their heads results in continued pressure being applied to one particular area on the baby’s head. Prematurity: If a baby is born prematurely, their cranial bones are much softer and more malleable which means they are more susceptible to external pressures affecting their head shape. Cranial bones typically strengthen in the final ten weeks of pregnancy and if a baby misses this crucial period of cranial strengthening, they are more likely to develop a form of flat head syndrome. Pre-birth moulding: Less frequently but still apparent, a baby can be born with flat head syndrome due to a restricted intrauterine environment or multiple births which cause ‘crowding’ within the womb. If the baby is in a prolonged breech position with a small amount of amniotic fluid, this will also lessen the internal cushioning in the uterus and apply pressure to the head. Plagiocephaly: One of the most common forms of flat head syndrome, plagiocephaly is usually characterised by a skull shaped like a parallelogram. Their appears to be an oblique slant on the surface of the skull with flattening on the left or right side of the skull which causes frontal bossing on the flattened side and bulging on the opposite side to the slant. 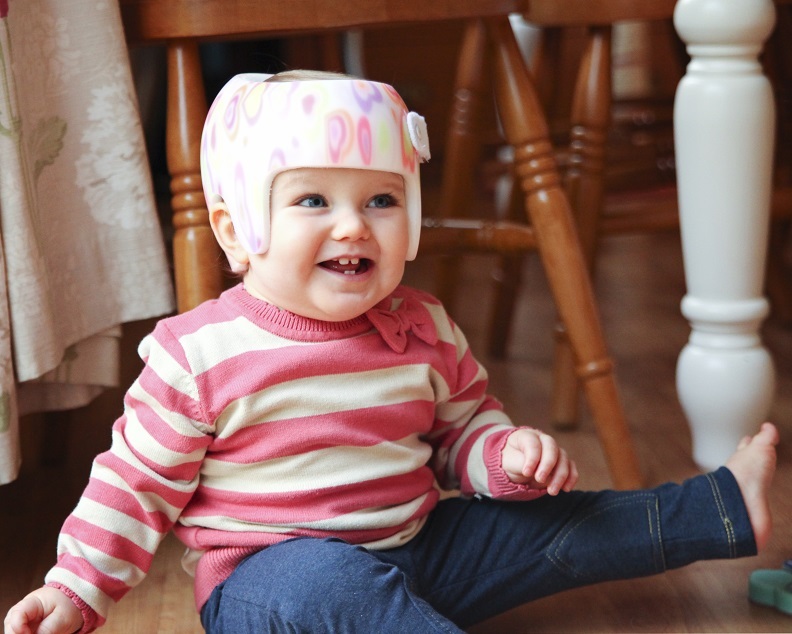 Classifying plagiocephaly can be difficult without an assessment from a clinical orthotist however the most common form is called positional plagiocephaly. The flattening in plagiocephaly usually results in facial asymmetry, particularly in the forehead region and this will cause a misalignment of the ears and eyes. Brachycephaly: is characterised as a flattening across the back of the skull which makes the head much taller than normal and creates much more prominence in the brow area. The width of the head is often disproportionate to the depth of the baby’s head. A combination of brachycephaly and plagiocephaly can often be found together, presenting as a wide, asymmetric head shape. For more information on brachycephaly and how it is treated, read our informative blog post which features a more detailed definition of brachycephaly, tips on how to prevent the condition and a mother’s personal journey of brachycephaly. If you are concerned about a baby’s head shape and suspect flat head syndrome, get in touch and book a free no-obligation assessment with one of our leading clinical orthotists who are able to diagnose and advice on the best form of treatment. For more information about what you can expect from an initial appointment with us, read our informative blog post on what happens at an initial evaluation.